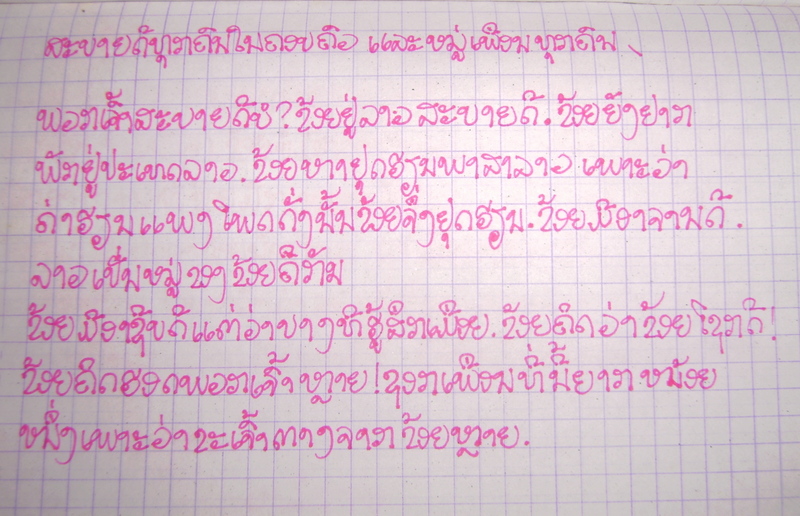 Now that I’m connected reliably to the internet at home again on my own computer its time for the post I promised about Lao language. 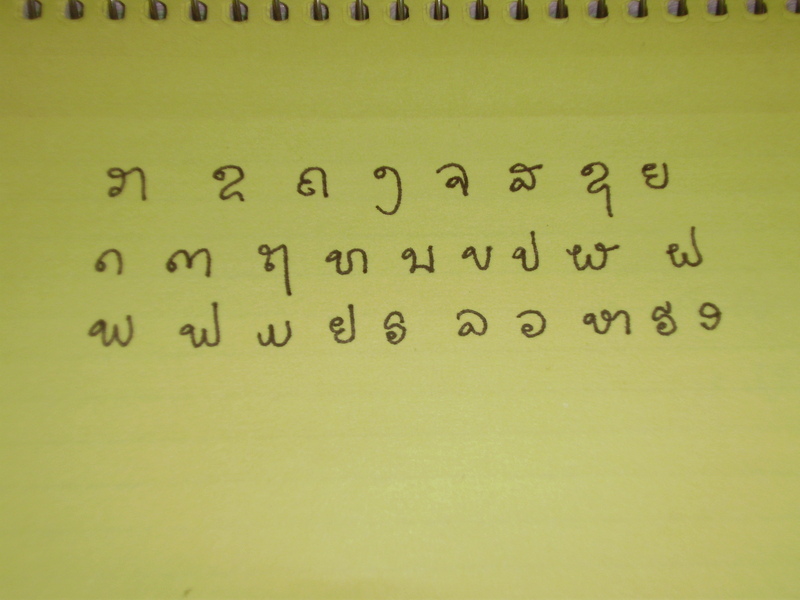 Lao is a tonal language –like Chinese– with a script based on sanskrit. There are many interesting features of the language such as single vowels that can appear before, after, under, over and surrounding consonants; with modifier-head constructions Lao is actually always head-modifier (old person vs. person old); like Chinese there are “disposable” phonemes that come at the end of sentences (sounds with no meaning but usage rules nonetheless). To me, Lao sounds much more sing-song-y than Chinese, especially when spoken by women. I also prefer the sound of Lao to Thai which is similar in script and vocabulary. As you can see there are some repeated letters. These are not hard as there is a low variation and a high variation. I have a hard time making and hearing a difference between b and bp and d and dt (though I’m gettin much better at that one). The vowels have two version of each: a long and a short. This is similar to Japanese long vowels. Some of the vowels can get complex and several are not sounds we have in English words exactly. Lao is traditionally not written with spaces between words but you can. In the letter below I don’t use spaces. I also prefer reading without the spaces. How are you all? I am doing well in Laos. I am still wanting to live in Laos. I have stopped studying Lao. Because the tuition was too expensive I stopped studying. I had a good teacher. She is also my friend. I have a great job but sometimes I feel tired. I feel very lucky! I miss you all so much. Making friends here is a little hard because people here are so different from me. In Laos there are many chicken, many children, and many good people. My teacher and my staff are all good people (maybe they aren’t really good but I’m not sure). I dont like Lao food very much but I have found food that I like to eat here. You all should come visit me. Unfortunately, my house is too small but if it was not too small you could stay with me. I hope that . My birthday is coming up next month. Don’t forget to send presents! I had been feeling pretty good about how much Lao I had learned until this afternoon when I tried to buy clear string to hang my laundry on to dry and couldn’t explain myself properly to the shop owner. Earlier in the day I heard a song in a coffee shop and had a hard time asking who sang it. Obviously there’s still sooo much that I don’t know how to express (it’s only been 4 months and 3 months of class), but sometimes it is frustrating when I realize there’s so much simple stuff I can’t say. Lao looks alien to me (literally. It looks like Martian). I can’t believe you can already say all of that in 3 months! Maybe you can start up language classes again in January?